CHICAGO- A year ago, Michigan State quarterback Brian Lewerke outlasted Damion Terry and Messiah deWeaver for the starting job and would set the course for an unexpected ride. A ride which proved to be a success as he played a vital part in turning the Spartans from a 3-9 campaign in 2016 to a 10-3 mark, capped off by a win in the Holiday Bowl over Washington State. 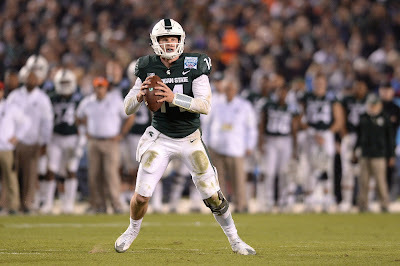 Despite bringing Michigan State back to the topic of conversation of being a contender in the Big Ten East and even the College Football Playoff this season, Lewerke knows work must be done to improve his offensive efficiency. As a sophomore, Lewerke completed 59 percent of his passes, to go along with 20 touchdowns and seven interceptions. Improvements with arm and foot techniques are also targets for the junior. Unlike quarterbacks in the past decade at MSU such as, Brian Hoyer, Kirk Cousins and Connor Cook, Lewerke possesses the ability to scramble if pressure comes in the pocket. The then-sophomore finished second on the team in 2017 with 559 rushing yards. Spartans coach Mark Danotnio believes Lewerke has the potential to be among the greats at MSU, but has some work to do to get there. With a year of experience under center and the only returner for MSU with any snaps from last season, Lewerke wants to do the best job possible to bring a Big Ten title to East Lansing for the third time in the last six seasons. MSU stands to be in a good spot for similar, if not more success this season as it hosts two of its biggest rivals— Michigan and Ohio State at Spartan Stadium and Lewerke could take that next step into the stratosphere of great quarterbacks produced.